Altitude (Low Pressure) Testing makes use of a vacuum chamber to simulate the effects of high altitude conditions. The pressure inside the altitude chamber can be reduced to correspond to the air pressure at a specific altitude. 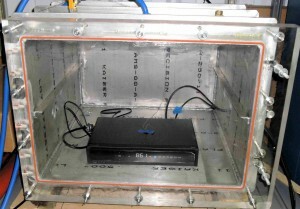 Products can be placed inside the altitude chamber and tested to determine if they will still function after exposure to a given duration at a specified altitude. Components sealed with internal fluid such as batteries or capacitors may fail or leak during altitude testing because an internal pressure results at rising altitudes as the external pressure is reduced. It is also possible to power a product during the test to verify that it remains operational during the altitude test. The lower pressure at higher altitudes can reduce the cooling of components which can lead to possible failures. 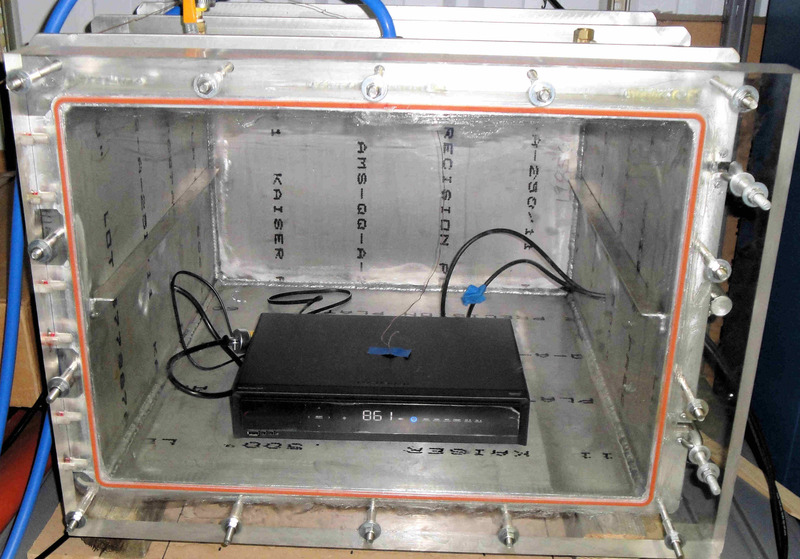 For this type of testing, it is necessary to have power and signal wires that can be fed into the altitude chamber without causing vacuum leaks. DES can provide a generic feed through that can be used for most testing. A custom feed through can also be fabricated if the component to be tested has specialized power or signal cables. It will be necessary to seal these cables to maintain the low pressure. Altitude testing is normally conducted at room temperature. It is also possible to perform altitude testing at hot and cold temperatures. This will increase the test time as additional time will be required to heat up or cool down the altitude chamber. Delserro Engineering Solutions, Inc. (DES) has many years of experience performing altitude testing and can assist customers in setting up a test using the proper test conditions. So if you do not know what test conditions that you should use, what specification to choose then we will help you because we are altitude testing experts! This entry was posted in Environmental & Climatic Testing and tagged altitude testing, IEC 60068-2, MIL-STD-202, MIL-STD-810, MIL-STD-883, RTCA DO-160 by DES. Bookmark the permalink. Yes it can. We typically follow the MIL-STD-810 or RTCA DO-160 specs. Coul you meet this specs?